We’ve all had it at some point. That wonderful client comes calling by with a project idea that is just perfect for you. You chat away for an hour or so, bouncing ideas off each other as a thousand amazing concepts start to take root in your head. Then comes the part where you talk about price, and everything comes crashing down. You see, this wonderful client, with his amazing idea, only has a budget of £350 for the branding of his new business and that fancy eCommerce website you’ve been chatting about. Disaster right? I mean what are your options here? Either you tell the client, sorry – there’s no way you can give him what he’s asking for that amount, and risk making him feel like a fool for not properly understanding your industry. Or you bite the bullet – take on the awesome project and work for about £5 an hour for the next month, developing a fondness for beans on toast in the process. Not necessarily – there is always a middle ground and contrary to what you may be thinking it doesn’t involve discounts and “special one off cases”. I’ve said before that I don’t do discounts. As soon as you start to lower your price or offer a special rate, then what you’re really doing is admitting to the client that you were overpriced to begin with. Your work is worth what you charge for it. It is a finite amount, no more, no less. You can’t be mad about a client trying to get a better deal, that’s them being a good business person. Once you drop your rate for a client it is a long and difficult climb to get back to the original fee you should have been charging in the first place. Once a client knows how to push your buttons, why wouldn’t they do that every time? You can’t be mad about a client trying to get a better deal, that’s them being a good business person. If you cave, then that’s on you. I say this not to put any of you down, but as someone who has done this literally hundreds of times in their career. When I first started as a designer I did this with almost EVERY SINGLE client, sometimes without them even asking. I was so fearful of loosing the job, that I’d instinctively tag on the phrase “but I could probably drop that to x amount if you wanted?”, to every quote. Decide what you are worth. Stick to it. So if your price is fixed solid, and we’ll assume that the clients budget is fixed solid, surely we’re at an impasse? Nope – think about this. Every project is a triangle. 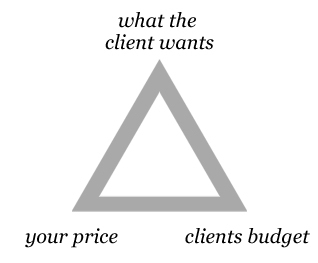 In one corner you have the price you charge for your services, in another corner you have the amount the client can pay, but in the third corner is the project itself – what the client actually wants. If the first two points cannot shift, then we need to see if the third one can. Clients can be stubborn, I know this. Some of them come to you with an idea so utterly rock solid in their heads that the concept may as well be carved in stone. However, they are not a designer, they have no idea how to look at a concept and see which bits take five minuets and which bits take five days. I guarantee you they’ll drop that idea like it was nuclear waste. They may well say to you that it absolutely has to be this way, and that they cannot possibly even consider an alternative, but when you point out that having hand drawn titles on every page of their website will eat up half their budget, I guarantee you they’ll drop that idea like it was nuclear waste. By pruning a clients concept like this you can shave off a lot of time and cost, ultimately making an unworkable project workable. Does the client really need a fully functioning blog that every member of their staff can log into remotely and post updates on what they’re working on (which you know they never will), or will a testimonials page achieve a similar goal? Another option is to take a step backwards and look not at what the client is asking for, but rather what they want to achieve. Say for instance a client comes to you looking to have each of their staff professionally photographed for their website or brochure. Ask them why. Not in a snarky or sarcastic way, but in a genuine manner. Why do you want all your staff photographed? What are you trying to achieve? In this instance they may want to put a human face to their business. Ok – well how about we take a group staff photo instead? One photo of everyone will cost far less than one of each staff member, and even though it’s not doing what the client asked for, it is achieving the same goal. View the goal your client wants to achieve and then give them some options. Again – this is exactly the kind of thinking that people come to designers for. It’s part of your job to educate your clients in methods and options that they may not have realised. Only you know how much effort, time and money something will cost – view the goal your client wants to achieve and then give them some options. Ok, so what if you’ve tried the first two options and the client still wont budge? Don’t worry there is still hope. If the client has this huge idea and simply cannot deviate, then your only remaining option is to break it down into stages. Instead of one huge job, try to look at the project as a group of smaller jobs and price them up accordingly. This way a client can cherry pick which bits they want to begin with (‘begin’ being the operative word here). Once those parts are done and paid for, the client can save up a bit more cash and move onto the next part of the project. The idea here is not to present this concept as though the client is only getting part of what they’re asking for, instead you’re offering a way to break down the project into milestones for them. They can take a look at exactly which bits are vital to their business, which bits they cannot function without. Once those are done, the client is free to get their project moving and potentially earning, allowing them to finance the next few stages that will really round off the project. I use this option all the time. The basic concept is “done is better than perfect”. It’s a phrase I hate, but when the alternative is zilch, it’s not a bad mantra. It’s a great way for a client to feel like things are really moving, and that they’re seeing big results fast. Get the core of the idea built, and then add on all those expensive flashing lights and dangley bits that the client thought were oh so vital. Not only is this approach good for the client, but it’s good for you. Setting milestones like this really help in staying on top of a project, and it also gives you the opportunity to get paid throughout the contract rather than waiting for that huge lump sum all at the end.